Zenescope returns once again to Comic-Con International at booth 2301 located immediately inside Hall C.
It’s there the company will unveil a variety of over 15 different convention exclusive covers as well as limited edition collectible merchandise including metal prints, trading cards, puzzles, gallery edition comic books, and much more. Appearing and signing at the booth will be Zenescope writers/creators Joe Brusha (Grimm Fairy Tales, The Black Sable), Ralph Tedesco (Grimm Tales of Terror, Van Helsing Vs Robyn Hood), LaToya Morgan (Robyn Hood: The Hunt, Goddess Inc.), Dave Franchini (Belle: Beast Hunter), and Victoria Rau (Peek-A-Boo). And on Saturday July 21st the company will also be celebrating “Christmas in July” where it will be releasing special edition holiday ornaments with artwork by superstar artist, J Scott Campbell. 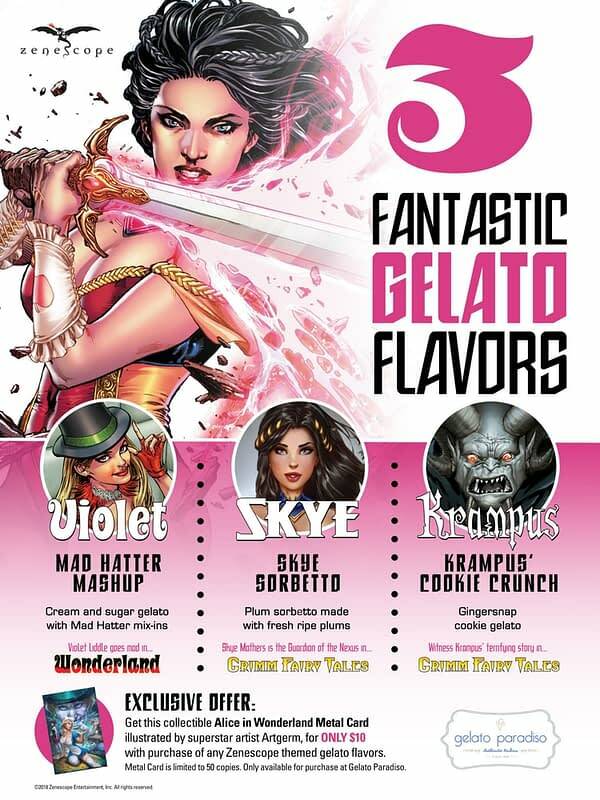 However, outside the show, where the air conditioning is less prevalent, Zenescope Entertainment will be partnering with Gelato Paradiso in San Diego with three original new gelato flavours, based on the company’s characters, offered throughout Comic-Con weekend. Flavours include Krampus Cookie Crunch, Mad Hatter Mash-up and Skye Mathers Sorbetto. Gelato Paradiso is located at 789 W Harbor Dr, only a 10 minute walk northwest of the San Diego Convention Center and customers who purchase any Zenescope themed gelato will be eligible to purchase a rare San Diego Comic Con Zenescope metal card limited to 50, while supplies last. 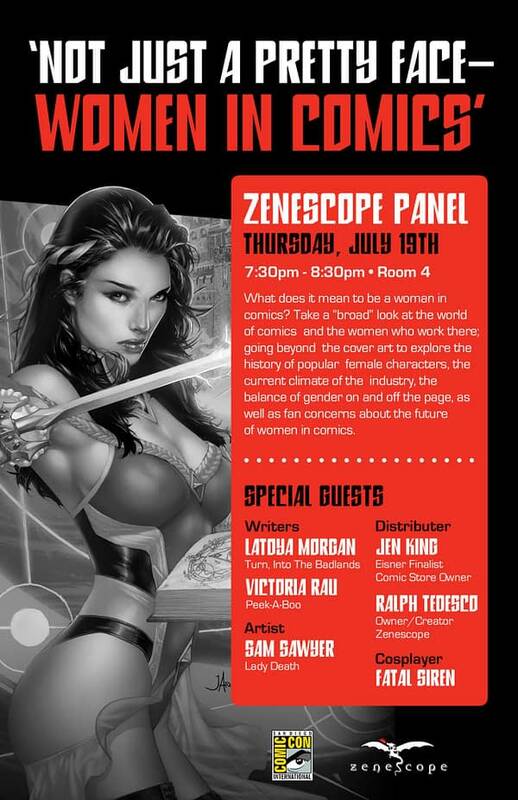 On Thursday July 19, 2018, some of Zenescope’s writers and creators will be appearing at the Not Just a Pretty Face-Women in Comics Panel in Panel Room 4, at 7:30PM, with panelists LaToya Morgan (Shameless, Into The Badlands, Zenescope’s Robyn Hood), Victoria Rau (Zenescope’s Peek-A-Boo), Sam Sawyer(Lady Death), Jen King (Eisner finalist, comic store owner), cosplayer Fatal Siren, and Zenescope co-founder Ralph Tedesco. 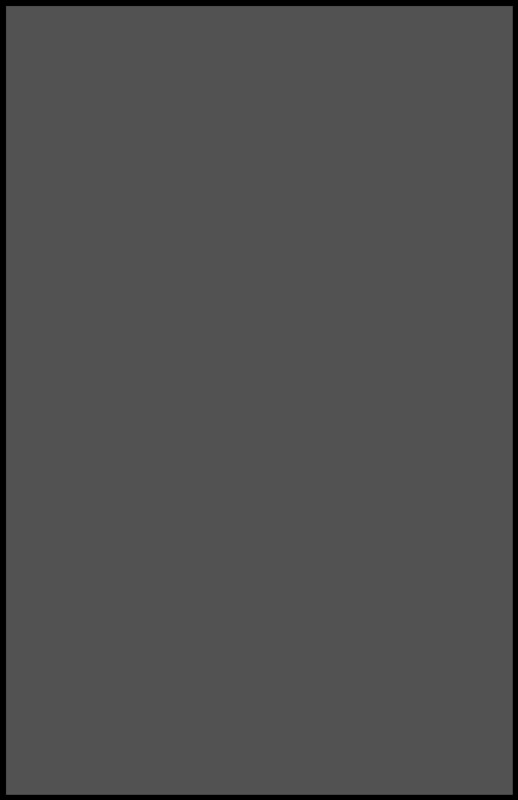 The panel will delve into the world of comics through the eyes of female creators while also touching on the steady increase in female protagonists and creators in independent comics over the past decade. I do hope they get some interesting questions from the audience. X-ual Healing: Old Man Logan #43 – My Name is Joy Jones. You Killed My Husband. Prepare to die.